CITY MULTI® VRFZ (Variable Refrigerant Flow Zoning) Systems: a user-friendly, ductless, or ducted commercial or residential comfort control system. CITY MULTI is the first two-pipe simultaneous cooling and heating system available in the United States. Yet our technology has a long, proven track record of quality and reliability around the world. Mitsubishi Electric, an acknowledged global industry leader, has installed CITY MULTI zoning systems in buildings throughout Asia, Europe, and elsewhere for nearly twenty years with great success and customer satisfaction. Let a All Climate representative show you how you can put the ultimate cooling and heating system to work for you and your customers right here, right now. The best way to ensure total comfort for the occupants of offices, schools, hospitals, assisted living facilities, hotels, and more is to provide each individual zone with a personalized comfort system. Zoning offers maximum individual comfort and energy savings because only the zones that need air conditioning receive it. Each zone of the CITY MULTI System has its own indoor unit or group of indoor units that precisely control the indoor temperature while operating at the most optimum energy usage. You set the comfort level, then relax. The CITY MULTI VRFZ (Variable Refrigerant Flow Zoning) System takes advantage of inverter technology by varying the speed of the compressor in the outdoor unit to meet the changing load requirements in each of the indoor zones. An energy wasting "dump zone" for excess hot or cold air as used with a typical zoning system is not necessary with CITY MULTI systems. Our system recycles the energy in other zones to provide comfort only to the zones calling for air conditioning. A CITY MULTI VRFZ System consists of an outdoor unit, a branch circuit (BC) Controller [depending on series], multiple indoor units, and corresponding system and zone controllers. Installation of this fully integrated zoning system is fairly simple. The outdoor unit, the BC Controller, and each of the indoor units are connected by a two-pipe refrigerant system. The outdoor unit and the BC Controller, depending on series, work in unison to deliver a variation of refrigerant flow to each indoor unit. The Direct Digital Controls system controls network link between the indoor units with the BC Controller and the outdoor unit to provide convenient control of the entire system. 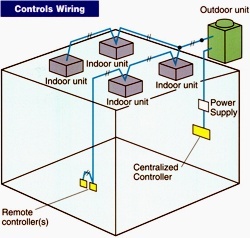 Separate remote controllers connected to individual indoor units - or groups of indoor units - provide individual zone control. These controllers provide a wide variety of configuration settings to satisfy each zone's requirements, including temperature control and timer settings. CITY MULTI is a simple, two-pipe system with easy, non-polar, two-wire control connections. These features add up to less labor and materials, quicker, easier installation, and a much lower overall operating cost for the building owner. CITY MULTI outdoor units can operate up to 20 ductless or ducted indoor units, making the system ideal for virtually any type of application or any variety of applications within the same building. Do you need air conditioning only on demand in a conference room? CITY MULTI provides that. Do you need a centralized system to cool or heat a large working area all day long? CITY MULTI does that. Do you want precise temperature control in a confined zone like a server room with no room for ductwork? CITY MULTI accommodates for this need as well. CITY MULTI works for almost any building that requires a diversified climate-control system. CITY MULTI VRFZ Systems provide virtually everything desired in an air-conditioning system. Direct Digital Controls (DDC) ensure optimized operation of the system. Mitsubishi Electric's inverter technology and electronic expansion valves vary the capacity of the system to match the indoor space load requirements. This feature saves energy and provides ultimate indoor comfort. Up to 20 indoor units can be employed with capacities that deliver up to 150% of the outdoor unit's rated capacity. The variable capacity capability of the indoor units removes any worry that the system could be oversized, a situation that contributes to moisture problems in a building. CITY MULTI is designed to provide the quietest possible operation for both indoor and outdoor environments. Indoor units operate as low as 24 dB(A), and outdoor units operate as low as 56 dB(A). That's a major benefit, especially for hospitals, other healthcare facilities, schools, and libraries. CITY MULTI dependably provides comfortable cooling and heating all year long. These compact and powerful R410A outdoor units have one of the smallest VRFZ footprints in the industry. There are three sizes available for each series: 72,000, 96,000, and 108,000 Btu/h, which are available in 208/230 volts, three-phase, 60 Hertz. The R410A outdoor units use Mitsubishi Electric's inverter-driven scroll compressor that is backed by a six-year limited warranty. This reliable compressor is designed and built by Mitsubishi Electric. The CITY MULTI R2-Series is a simultaneous cooling and heating outdoor unit, which uses the BC Controller to connect up to 20 indoor units with only two pipes to provide energy-saving heat recovery operation. The BC Controller is a key component used in unison with the R2-Series outdoor unit to provide simultaneous cooling and heating. It redirects refrigerant away from the outdoor coil to be shared by various indoor coils. 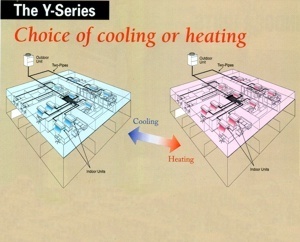 This unique function transfers heat energy that is otherwise wasted from zones calling for cooling to other zones that call for heating. This capability means less work is required of the outdoor unit, which saves energy and can increase overall capacity. 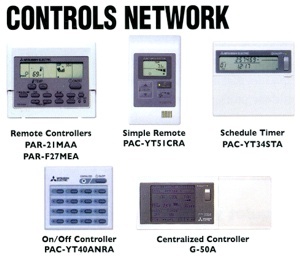 Your choice of BC Controller is based on the number of corresponding indoor units. BC Controllers are available with 5, 6, 8, 10, 13, and 16 branches. The CITY MULTI Y-Series is an outdoor unit flexible enough to cool or heat up to 19 individual zones to maximize your design options. Individual controls for each zone contribute to personalized comfort. Mitsubishi Electric's selection of six different styles of indoor units allows you to choose the models and sizes that will meet your requirements for indoor unit layout and design. The PFKY is a sleek wall-mounted model for high-wall applications. The PLFY ceiling-recessed cassette model provides two, three, or four-way airflow. 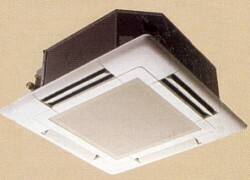 The PMFY is a ceiling-recessed cassette model with one-way airflow. The PDFY and PEFY are ceiling-concealed ducted models for discreet applications. 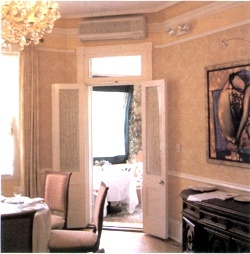 The PFFY is a concealed or exposed floor-standing model. CITY MULTI Controls Network (CMCN) uses Mitsubishi Electric's advanced M-NET controls network Mitsubishi Electric's reliable high-speed communication bus, M-Net, allows data to flow in large capacities to ensure optimized performance of the system. Each component is integrated on the M-Net for precise control of the temperature by regulating the output of the outdoor unit capacity to match the needs of each comfort zone. Zones are actively cooled in one zone while heating another. Set up zones to maximize simultaneous operation: interior/ exterior, eastern exposure/western exposure. 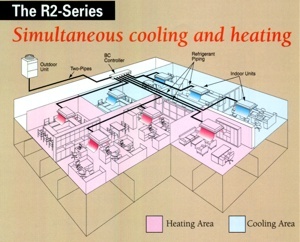 Each zone gets the cooling or heating that is needed at any time. Simultaneous cooling and heating over two-pipes provides air conditioning and control flexibility to each and every zone. CITY MULTI delivers precise individual comfort. Regardless of time of day, sun or shade, season of the year, or special room requirements, CITY MULTI provides control of comfort. You place the personalized comfort at your fingertips. CITY MULTI is designed for the quietest possible operation both indoors and out. Outdoor units are as quiet as 56 dB(A) and indoor units as low as 24 dB(A). That's a huge advantage, especially for classrooms, schools, universities, hospitals, other healthcare facilities, and libraries, where quiet conversations are paramount. CITY MULTI VRFZ Systems have been operating worldwide for 20 plus years virtually worry-free due to the quality of Mitsubishi Electric engineering. Our advanced yet simple-to-use analytical tools in the hands of our well-trained service team keep the systems running smoothly. The scroll compressor's six-year limited warranty is an added benefit. Design flexibility CITY MULTI VRFZ Systems provide engineers the flexibility to meet their application designs ranging from the simple to the complex. Each CITY MULTI system can be configured for up to 20 zones within a building. Multiple CITY MULTI systems can be integrated into our controls network to air-condition and manage up to 2,000 zones from a single networked computer using Mitsubishi Electric furnished software. CITY MULTI's inverter technology is highly responsive and efficient. By varying the capacity of the system to match your indoor space load requirements while responding to outdoor conditions, CITY MULTI provides the ultimate in precise indoor comfort control plus great energy savings. The CITY MULTI Controls Network (CMCN) utilizes Mitsubishi Electric's advanced M-NET technology to provide individual, personalized comfort and powerful centralized control. Each component is integrated onto the secure high-speed communication bus to provide precise temperature control by varying the output of the outdoor unit(s) to match the needs of each zone. In today's modern building practices, the interior mechanical components are all designed for ultimate comfort and functionality. Aesthetics are also an important aspect of that comfort. CITY MULTI VRFZ Systems offer many sleek styles of ductless or ducted indoor units for various applications. Each indoor unit gives you ultimate zoning flexibility in each space. And all are compatible with both the R2-Series and Y-Series outdoor units. The PKFY wall-mounted indoor unit is very quiet with sound ratings as low as 32 dB(A). The seven sizes available for the PKFY models are 6,000, 8,000, 12,000, 15,000, 18,000, 24,000 and 30,000 Btu/h. This style indoor unit is well-suited for hotels, assisted living facilities, offices, residences, and other applications where wall space is available. The PLFY is our ceiling-recessed type indoor unit with a two, three, or four-way airflow option. These models give you discreet individual room control and four fan speed settings. They can be installed in a lay-in tile or drywall ceiling. The unit can be serviced by simply removing the grill. The PLFY units have a built-in, drain-lift mechanism thirty-three inches of condensation lift. They are extremely quiet with sound ratings in the low-to-mid 40 dB(A) range and can be connected to ventilation air. The six sizes available for the PLFY are 12,000, 15,000, 18,000, 24,000, 30,000, and 36,000 Btu/h. PLFY models are well-suited for office buildings, school classrooms, computer server rooms, and other applications where at least 12" of space is available above the ceiling. 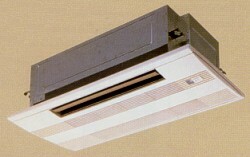 The PMFY is a ductless, one-way, ceiling-recessed cassette indoor unit that can be connected to ventilation air. This unit is very easy to install and is offered in four capacities: 6,000, 8,000, 12,000 and 15,000 Btu/h. The PMFY model is designed for use in areas that cannot support ductwork or lack the sufficient space to support wall-mounted units. 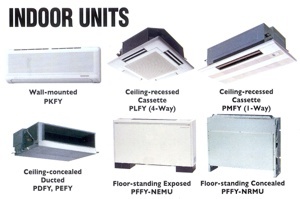 The PDFY and PEFY are concealed-type, ducted indoor units with the ability to attach ductwork and can be connected to ventilation air. These units give you individual zone control with up to four fan speed settings. They are installed above the ceiling and allow multiple outlets to be ducted from them. The low profile design allows maximum flexibility in air-conditioning hard-to-reach zones or for zones that are larger in size. The PDFY and PEFY are extremely quiet. The PDFY has multiple static pressure settings. Capacities range from 6,000 to 54,000 Btu/h. This style of indoor unit is well-suited for office buildings, schools, hotels, assisted living facilities, residences, and other applications where ceiling space is available and the most discreet mechanical system is desired. The PFFY floor-mounted models are available as an exposed or concealed indoor unit. These two models are available in six nominal capacities: 6,000, 8,000, 12,000, 15,000, 18,000, and 24,000 Btu/h. The PFFY-NEMU requires no finish work and is perfect for any application, especially schools, office buildings, and hotels. While the PFFY-NRMU is designed for large jobs requiring a built-in, concealed floor-mounted unit, it practically disappears in the room. Our CITY MULTI makes it easy to manage your building. The CMCN manages up to 2,000 indoor units from a single network PC in terms of operation, monitoring, scheduling (daily, weekly, and yearly), error email, personal browser, tenant billing, and maintenance diagnostic information. The CITY MULTI Controls Network (CMCN) puts individual, personalized comfort in the hands of the tenants and the building manager. Flexible design for customized, individual zone control Building owners and engineers can select from a wide variety of remote controllers and timers to satisfy the exact level of tenant control on a zone-by-zone basis, while providing the ultimate in individualized control. Each Indoor unit may have one or two remote controllers or none at all. The remote controllers allow the temperature setpoint to be changed along with On/Off control and fan speed adjustment. Mode selection (Cool/Heat/Dry/Fan/Auto) and vane control are also possible, depending on the remote controller. The CMCN enables the room temperature to be sensed either at the remote controller in the zone or the temperature to be sensed at the actual indoor unit simply by changing the dip switch setting on the indoor unit. Depending on the type of the remote controller, the remote controller can be physically located in the controlled zone or, in a physical location different than the controlled zone to meet the customers specific requirements. The versatility of the CMCN customizes each buildings controls network to address the specific design and tenant requirements, while providing unparalleled comfort conditioning. It's a simple, two-pipe system with simple, non-polar, two-wire control connections. All components are daisy-chained and addressed onto the M-Net communication bus. It all adds up to less labor and materials with quicker installation. Optional Easy-to-use control via PC web browser With the CMCN, you have the option to control multiple CITY MULTI systems with the G-50A Centralized Controller(s) from a PC's web browser. From Internet Explorer® on a PC, the building manager can now monitor, operate, and schedule (daily, weekly, and yearly) the HVAC system through the G-50A network. Emails can be automatically generated when an abnormal condition is detected on the system with the source address and the error code. In addition, the building manager can enable tenants to control their own individual zones via the web browser on their networked PC. From a single network PC configured with our TG-2000 software, you can control up to 2,000 units. Our TG-2000 integrated system software provides the ultimate in building management by allowing input of the building's floor plan with illustrative icons for the CITY MULTI indoor units. This software, in conjunction with a maximum of 40 G-50A Centralized Controllers, empowers the building manager to control the HVAC system for multiple buildings in a business park, educational campus, or retirement facility. The TG-2000 software configured with the tenant billing option and interconnected with a RS-485 watt-hour meter can calculate the energy consumption relative to the each outdoor unit on a per-tenant basis and generate a per-tenant CITY MULTI energy bill. Not only can our CMCN act as a stand-alone building management system; it can also integrate with existing systems via LonWorks® or BACnet® interfaces. The best way to ensure total comfort for the occupants of offices, schools, hospitals, assisted living facilities, hotels, and more is to provide each individual zone with a personalized comfort system. Zoning offers maximum individual comfort and energy savings because only the zones that need air conditioning receive it. Each zone of the CITY MULTI System has its own indoor unit or group of indoor units that precisely control the indoor temperature while operating at the most optimum energy usage. You set the comfort level, then relax. The CITY MULTI VRFZ (Variable Refrigerant Flow Zoning) System takes advantage of inverter technology by varying the speed of the compressor in the outdoor unit to meet the changing load requirements in each of the indoor zones. An energy wasting “dump zone” for excess hot or cold air as used with a typical zoning system is not necessary with CITY MULTI systems. Our system recycles the energy in other zones to provide comfort only to the zones calling for air conditioning. A CITY MULTI VRFZ System consists of an outdoor unit, a branch circuit (BC) Controller [depending on series], multiple indoor units, and corresponding system and zone controllers. Installation of this fully integrated zoning system is fairly simple. The outdoor unit, the BC Controller, and each of the indoor units are connected by a two-pipe refrigerant system. The outdoor unit and the BC Controller, depending on series, work in unison to deliver a variation of refrigerant flow to each indoor unit. The Direct Digital Controls system controls network link between the indoor units with the BC Controller and the outdoor unit to provide convenient control of the entire system. Separate remote controllers connected to individual indoor units – or groups of indoor units – provide individual zone control. These controllers provide a wide variety of configuration settings to satisfy each zone’s requirements, including temperature control and timer settings. CITY MULTI outdoor units can operate up to 20 ductless or ducted indoor units, making the system ideal for virtually any type of application or any variety of applications within the same building. Do you need air conditioning only on demand in a conference room? CITY MULTI provides that. Do you need a centralized system to cool or heat a large working area all day long? CITY MULTI does that. Do you want precise temperature control in a confined zone like a server room with no room for ductwork? CITY MULTI accommodates for this need as well. CITY MULTI works for almost any building that requires a diversified climate-control system. CITY MULTI VRFZ Systems provide virtually everything desired in an air-conditioning system. Direct Digital Controls (DDC) ensure optimized operation of the system. Mitsubishi Electric’s inverter technology and electronic expansion valves vary the capacity of the system to match the indoor space load requirements. This feature saves energy and provides ultimate indoor comfort. Up to 20 indoor units can be employed with capacities that deliver up to 150% of the outdoor unit’s rated capacity. The variable capacity capability of the indoor units removes any worry that the system could be oversized, a situation that contributes to moisture problems in a building. CITY MULTI is designed to provide the quietest possible operation for both indoor and outdoor environments. Indoor units operate as low as 24 dB(A), and outdoor units operate as low as 56 dB(A). That’s a major benefit, especially for hospitals, other healthcare facilities, schools, and libraries. CITY MULTI dependably provides comfortable cooling and heating all year long. These compact and powerful R410A outdoor units have one of the smallest VRFZ footprints in the industry. There are three sizes available for each series: 72,000, 96,000, and 108,000 Btu/h, which are available in 208/230 volts, three-phase, 60 Hertz. The R410A outdoor units use Mitsubishi Electric’s inverter-driven scroll compressor that is backed by a six-year limited warranty. This reliable compressor is designed and built by Mitsubishi Electric. Mitsubishi Electric’s selection of six different styles of indoor units allows you to choose the models and sizes that will meet your requirements for indoor unit layout and design. Mitsubishi Electric’s reliable high-speed communication bus, M-Net, allows data to flow in large capacities to ensure optimized performance of the system. Each component is integrated on the M-Net for precise control of the temperature by regulating the output of the outdoor unit capacity to match the needs of each comfort zone. CITY MULTI is designed for the quietest possible operation both indoors and out. Outdoor units are as quiet as 56 dB(A) and indoor units as low as 24 dB(A). That’s a huge advantage, especially for classrooms, schools, universities, hospitals, other healthcare facilities, and libraries, where quiet conversations are paramount. CITY MULTI VRFZ Systems have been operating worldwide for 20 plus years virtually worry-free due to the quality of Mitsubishi Electric engineering. Our advanced yet simple-to-use analytical tools in the hands of our well-trained service team keep the systems running smoothly. The scroll compressor’s six-year limited warranty is an added benefit. Design flexibility CITY MULTI VRFZ Systems provide engineers the flexibility to meet their application designs ranging from the simple to the complex. Each CITY MULTI system can be configured for up to 20 zones within a building. Multiple CITY MULTI systems can be integrated into our controls network to air-condition and manage up to 2,000 zones from a single networked computer using Mitsubishi Electric furnished software. CITY MULTI’s inverter technology is highly responsive and efficient. By varying the capacity of the system to match your indoor space load requirements while responding to outdoor conditions, CITY MULTI provides the ultimate in precise indoor comfort control plus great energy savings. The CITY MULTI Controls Network (CMCN) utilizes Mitsubishi Electric’s advanced M-NET technology to provide individual, personalized comfort and powerful centralized control. Each component is integrated onto the secure high-speed communication bus to provide precise temperature control by varying the output of the outdoor unit(s) to match the needs of each zone. In today’s modern building practices, the interior mechanical components are all designed for ultimate comfort and functionality. Aesthetics are also an important aspect of that comfort. CITY MULTI VRFZ Systems offer many sleek styles of ductless or ducted indoor units for various applications. Each indoor unit gives you ultimate zoning flexibility in each space. And all are compatible with both the R2-Series and Y-Series outdoor units. The PLFY is our ceiling-recessed type indoor unit with a two, three, or four-way airflow option. These models give you discreet individual room control and four fan speed settings. They can be installed in a lay-in tile or drywall ceiling. The unit can be serviced by simply removing the grill. The PLFY units have a built-in, drain-lift mechanism thirty-three inches of condensation lift. They are extremely quiet with sound ratings in the low-to-mid 40 dB(A) range and can be connected to ventilation air. The six sizes available for the PLFY are 12,000, 15,000, 18,000, 24,000, 30,000, and 36,000 Btu/h. PLFY models are well-suited for office buildings, school classrooms, computer server rooms, and other applications where at least 12″ of space is available above the ceiling. 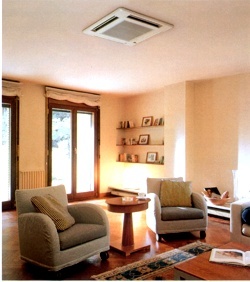 The PFFY floor-mounted models are available as an exposed or concealed indoor unit. These two models are available in six nominal capacities: 6,000, 8,000, 12,000, 15,000, 18,000, and 24,000 Btu/h. The PFFY-NEMU requires no finish work and is perfect for any application, especially schools, office buildings, and hotels. While the PFFY-NRMU is designed for large jobs requiring a built-in, concealed floor-mounted unit, it practically disappears in the room. The CMCN manages up to 2,000 indoor units from a single network PC in terms of operation, monitoring, scheduling (daily, weekly, and yearly), error email, personal browser, tenant billing, and maintenance diagnostic information. The CITY MULTI Controls Network (CMCN) puts individual, personalized comfort in the hands of the tenants and the building manager. Building owners and engineers can select from a wide variety of remote controllers and timers to satisfy the exact level of tenant control on a zone-by-zone basis, while providing the ultimate in individualized control. Each Indoor unit may have one or two remote controllers or none at all. The remote controllers allow the temperature setpoint to be changed along with On/Off control and fan speed adjustment. Mode selection (Cool/Heat/Dry/Fan/Auto) and vane control are also possible, depending on the remote controller. The CMCN enables the room temperature to be sensed either at the remote controller in the zone or the temperature to be sensed at the actual indoor unit simply by changing the dip switch setting on the indoor unit. Depending on the type of the remote controller, the remote controller can be physically located in the controlled zone or, in a physical location different than the controlled zone to meet the customers specific requirements. The versatility of the CMCN customizes each buildings controls network to address the specific design and tenant requirements, while providing unparalleled comfort conditioning. It’s a simple, two-pipe system with simple, non-polar, two-wire control connections. All components are daisy-chained and addressed onto the M-Net communication bus. It all adds up to less labor and materials with quicker installation. With the CMCN, you have the option to control multiple CITY MULTI systems with the G-50A Centralized Controller(s) from a PC’s web browser. From Internet Explorer® on a PC, the building manager can now monitor, operate, and schedule (daily, weekly, and yearly) the HVAC system through the G-50A network. Emails can be automatically generated when an abnormal condition is detected on the system with the source address and the error code. In addition, the building manager can enable tenants to control their own individual zones via the web browser on their networked PC. From a single network PC configured with our TG-2000 software, you can control up to 2,000 units. Our TG-2000 integrated system software provides the ultimate in building management by allowing input of the building’s floor plan with illustrative icons for the CITY MULTI indoor units. 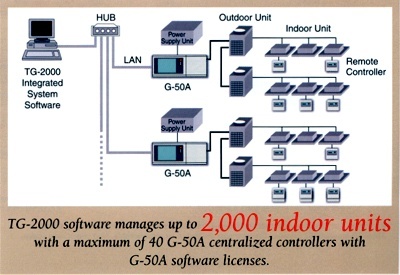 This software, in conjunction with a maximum of 40 G-50A Centralized Controllers, empowers the building manager to control the HVAC system for multiple buildings in a business park, educational campus, or retirement facility.